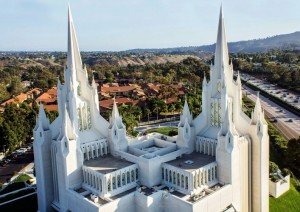 Numerous places to visit in San Diego are landscaped parks and unique cultural theme parks, spectacular museums with rare exhibits and excellent winery. 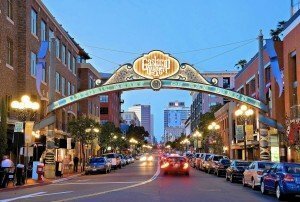 San Diego – a large and very interesting city, full of museums, parks, beaches, amusement parks and historic sites, which are directly linked with the history of the first Europeans at the present ground of California. Despite the impressive size, the city is quiet enough, and the atmosphere in it the most peaceful. Unofficially, the city is divided into several areas, each of which – your place of interest. Downtown is located in the bay and is a center of commerce and nightlife. 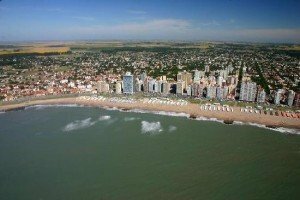 There are also many hotels, restaurants, clubs and bars. Balboa Park District – the heart of the city, and the park – the second largest urban park in the world. There is a huge number of museums, historical and cultural attractions, and the famous San Diego Zoo. The third interesting from a tourist point of view of the area – it’s old town and Mission Valley. This is where the Spanish founded the first settlement in California, and today we can see many old buildings in which museums operate. 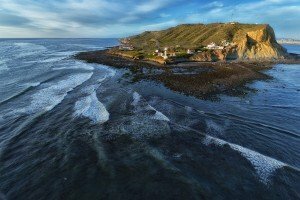 Stunning scenery and unique attractions of the charming city of California is so bright, colorful and original, it is important that they embody not only in memory but also in time to save on quality digital video or photo. 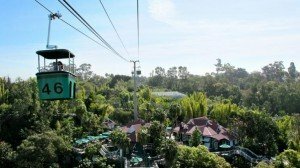 One of the largest and most progressive zoos in the world, which contains more than 4,000 species of animals is the zoo that is located in San Diego, California. You will need about 40 minutes to get acquainted with the main part of the zoo on the tour bus or tram overhead. 18 variations of eucalyptus trees to feed the koala bear. 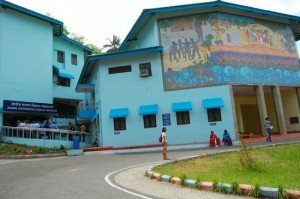 Interesting: This place is perfect for families with kids. Driving on a special train around the entire park you can see hippos, giraffes, tigers. The club plays music to suit all tastes from salsa to contemporary rhythms. Walking through the cobbled streets of the center under the yellow gas lamps, you feel at the beginning of the last century. Since then a lot of historical buildings have remained there. 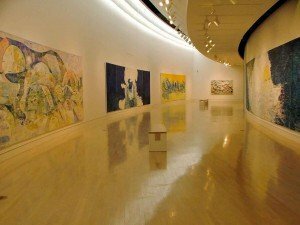 In addition to the entertainment there is a wide variety of art galleries and theaters. Interesting: There are quite a lot of historic buildings located, with its magnificent architecture of the early twentieth century this place creates a unique atmosphere. or pass by beautiful beaches and quiet lagoons of the Highway Silver Strand. 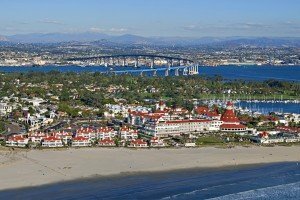 There is a historical monument of the city – the hotel “Del Coronado.” It is well-known for the fact that it was this place where the famous movie “Some Like It Hot” was filmed. Famous people stayed here. For example, the writer Frank Baum, who wrote here the part of the “Wizard of Oz”. From past times Victorian architecture has remained here. 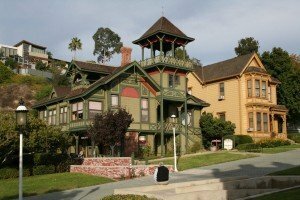 Interesting: The hotel is famous for its Victorian architecture and a convenient location –not far from the ocean. 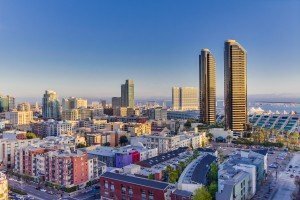 The biggest urban cultural park in the US, the heart and soul of the city is located in San Diego, California. Architecture has been executed in the style of different eras (baroque, gothic and others.). In an area of ​​4.8 km² there are a lot of museums on any subject, from the hardware to the art (for example, the Museum of History and Art Museum of pictures). Balboa is a reflection of the diversity of ethnic city. After all, here you can visit the Japanese garden of friendship and the Spanish village, as well as get acquainted with the African culture and visit the exhibition of Mexican art. Interesting: The pearl of Balboa Park is a copy of the well-known Shakespearean theater – Old Globe Theatre. In San Diego, California, there is the base and airfield of Miramar Marine Corps. In mid-October, Marine Base “Miramar” holds an annual air show (Miramar Air Show), which attracts more than 500,000 spectators each year. After all, the famous demonstration team of the US Navy “Blue Angels” take part in this show. On Independence Day Marines conduct demonstrations at the Coronado peninsula with the shooting, explosions and landing from helicopters and airplanes. There is an open air museum, where there were about two dozen aircraft in the Marine Corps base: from propeller planes from World War II to modern helicopters and jet machines like the F-18. Interesting: Excursions at Miramar are held twice a week. This place is a mixture of Spanish, Native American and Mexican cultures. Only here you can taste real “Margarita” and visit the Bazaar del Mundo with Mexican food restaurants. If you like tasty spicy food, there is no better destination than this place. even ghosts House for thrill-seekers. Interesting: Old city is a good place for those who like spending time in some interesting places which present a combination of cultures. Interesting: If you would like to have an excursion, then the peninsula sailors would be glad to organize a tour to the 200-year-old lighthouse. Downtown is one of the most fashionable destinations in the country. superfashionable districts: East Village and Marina District. Victorian buildings from the late 19th century have been merged with modern hotels, as if trying to make a lasting impression on guests. Interesting: Theaters, nightclubs, music hall, a lot of restaurants do not let the guests all day long until late at night. 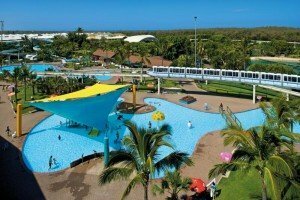 There are aquariums with large fish (harmless sharks) and little penguins, pink flamingos and entertainment attractions. The most popular show in the park Sea World is the show with killer whales. For those who want to stay wet during the show, you need to take place in the first 14 rows. Other shows: “Dolphin”, “Pirates 4-D”, as well as an entertaining spectacle pets, playing with the inhabitants of the marine world. Fans of the penguins need to visit a piece of the Arctic wilderness. For the very young guests there are special aquariums, where you can touch starfish and other marine life. Interesting: The park is open daily, opening hours of the park vary according to the season. 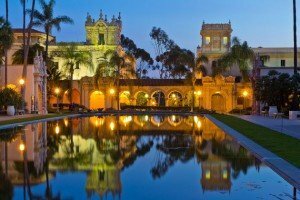 The museum is located in Balboa Park, in the former building of the “Ford”, which is entered in the National Register of Historic Places. It first opened its doors to the public in 1963. 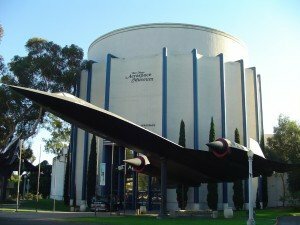 Today the museum exposition is divided into several galleries, exhibitions which tell about the contribution of San Diego in the development of world aviation. as well as a pavilion fly Edwin D. MakKeller. Two restoration workshops are working at the museum: one on the spot, the other – on the airfield Gillespie. The local complex is also open to the public and exploring the numerous exposed open-air aircraft. Interesting: There is a library with a large collection of not only books, but also historical photographs of the aircraft and its production process. This museum is more than remarkable in every respect. Firstly, its rich collection, the emphasis of which is made to the history of pre-Columbian Americas. Secondly, the museum occupies a historic building of California, part of the “quadrangle of California,” which absolutely cannot be ignored – even if you haven’t had an intention to go inside. This is a great building, reminiscent of its dome, painted in blue and gold tones, and the adjacent high, richly decorated with magnificent church tower. Most impressive is stone carving that adorns the facade of the tower and tiers, as well as an abundance of stone sculptures on them. The figures depict Yunipero Serra, Philip III of Spain, George Vancouver, Carlos III of Spain, and so on. D. The collection contains materials that have been received from various Native American tribes in the region of Southern California, as well as artifacts of mid-American civilizations such as the Maya. Moreover, the museum has one of the most important collections of Egyptian artifacts in the United States. It includes real mummies, funeral masks, figurines and seven painted wooden sarcophagi. The exhibition dedicated to the 10,000-year history of brewing in the world and the technology of manufacturing of beer that was practiced by the ancient Egyptians, Sumerians. the exhibition “Maya: heart of heaven, heart of the earth “, where you can see several monuments – copies of the stelae from Guatemala, and the exhibition” Monsters “, specifically designed for children (there are interactive displays, which presents folk and other artifacts, in one way or another connected to monsters and mythological creatures – more than 50 monsters from all over the world, including dragons, yetis). Interesting: The biggest rarity in Egypt exposition – an incredibly rare children’s sarcophagus of Ptolemaic dynasty: there are only 7 of them in the whole world. The reserve is formally in the city of San Diego. Yet it remains a genuine area of ​​untouched nature: it is the wildest strip of land (an area of ​​8 sq. km) in the entire South coast of California. 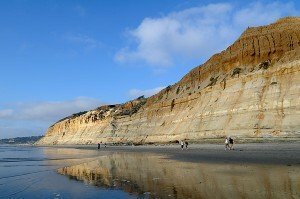 The whole area of ​​the park is 2,000 acres of coastal areas, which have been declared a national natural landmark in 1977.
and, of course, the very rare Torrey pine. There are about 15 km of hiking trails, and at the top, on the rocks, there is a small museum, a hotel and a tourist station. Rare Torrey pine grows only in San Diego and at one of the islands Channel. Interesting: These pine trees can be seen only by the sea, and now they are under threat of destruction. This museum is located on the boulevard of El Prado in Balboa Park. It has a large collection of extremely valuable Spanish art. The museum was opened in 1926 as an art gallery, which is why the administration of Balboa Park claims that this museum – the oldest and largest art museum area. Every year it is visited by about half a million people. The museum building was designed by architect William Johnson and R. Snyder and carried out in an interesting Plateresque style, so as not to disturb the harmony with the other buildings at the “Panama-California”. Construction took two years, after which A. Bridges, who funded it, given the building to the city. In 1966, the museum built a west wing with a sculptured courtyard, which increased its size by half, and in 1974 – the east wing. The museum’s collections are grouped by historical periods, with the oldest which are 5000-th years. BC., and the youngest – nowadays. The first among the world’s masterpieces, which the museum can boast of today, is the picture of Francisco Goya, bought in 1939 from a private collection. In the subsequent decade, the museum was able to purchase the paintings of Giovanni Bellini and Diego Velazquez. The most striking masterpieces of the collection, which should be definitely seen, being in a museum – it is “Christ’s arrest” brush of Hieronymus Bosch, “The Vision of St. Anthony of Padua “Giambattista Pitton,” “Renoir works and” Bouquet “by Matisse. Interesting: Among more modern authors whose works can also be seen in the museum are German expressionists such as Otto Dix, Egon Schiele and Gustav Klimt. a gallery of Lionel toy trains of the type O. scale. Your children will be happy to visit Toy Train Gallery, which includes four separate railway lines with realistic scenery and a variety of management options. Interesting: The gallery includes Lionel collection of rare cars and American Flyer of 1920-1950-ies. It was the first Franciscan mission in the province of Las Kalifornias Viceroyalty of New Spain, founded in 1769 by the Spanish monk Yunipero Serra on land that belonged to the Indians. In 1834, missions were bought by former military officers who fought in the war for independence against Spain. 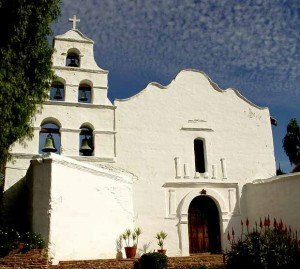 In 1846 Mission San Diego de Alcala was given to the governor Pio Pico in the hands of Santiago Arguello to be used for state needs, and after the merger of California to the US, it was used by the army until 1862. Here the first Christian martyr of California, Luis Jaime was buried. Interesting: Currently the mission has the status of the National Historic Landmark. Howfacecare.com: how to get rid of a hickey.